… Government incentives in Australia’s priciest market led to construction of less than 1% of total affordable homes … i.e. .5% in eight (8) years! The developers get a substantial FSR bonus under the ARH SEPP – and apparently there is no compliance regime? NSW is now embarking to build 23,000 social and 500 affordable homes in 10 years; a second programme of 3,400 social and affordable homes across NSW over the next 4 years. THIS is despite a 5 – 10 year waiting list for public (social) housing and a whole Cohort of Australians locked out of the housing market! AND in NSW there are 37,715 Homeless last census night (2016) , the statistics bureau found. The NSW Federation of Housing Associations CEO, Wendy Hayhurst, said the voluntary planning agreements were flawed, due to their voluntary nature and lack of any compliance. Unaffordable housing has led to an “increasingly dependent generation” of young people, a new study has found, with many Australians resigned to living with their parents for longer as they save for a deposit. The Perceptions of Housing Affordability report by property data analysts Core Logic found almost two-thirds (62%) of respondents who were living with their parents said they did so because they could not afford to move out. Twenty-seven per cent of those aged 18 or over and living in the family home were saving towards a deposit, while 21% expected to remain with their parents until they were at least 30 years old. Lisa Claes, the managing director of Core Logic, said in the longer term, this could move parents to “fashion some sort of independent living arrangements” in which to accommodate their adult children in the family home. She called the reluctant compromise “cubby house syndrome”, with underutilised spaces such as garages or rumpus rooms repurposed “to give young people some semblance of independence, even when they can’t afford to fly the nest completely”. Of the total “millennial” respondents aged 18 to 34, 38% were renting and 27% were living with their parents. Sixty-two per cent of respondents across all ages said a well-paying job was their best shot at getting on the property ladder, with 30% holding out for an inheritance or assistance from their family. Eight-seven per cent of non-homeowners who responded to the survey were concerned they could not afford to do so. Nationally, simply saving for a deposit was perceived to be the biggest impediment to buying a property, followed by the cost of stamp duty, which was of greatest concern in New South Wales. Davis, who identified herself as a “card-carrying member of Gen X”, said the data showed millennials faced greater barriers to home ownership than previous generations had at their age. High earners who were renting were more likely to expect parental assistance in home ownership, either through an inheritance or their parents buying them a house (34%) compared with 26% of those earning under $40,000. More than three-quarters (76%) of existing homeowners were concerned about moving to their next property. Among apartment owners who might have been aspiring to move somewhere bigger, that figure rose to 88%. The survey did suggest prospective buyers were willing to compromise in order to buy their own home, with 33% stating they would make concessions regarding a more affordable property and 27% open to moving further away from work. But location was a sticking point, with only 14% expressing openness to moving interstate and 21% to a less desirable area. Davis said millennials in particular were motivated by proximity to work, with many of the most rewarding and highest-paid job options focused in capital cities. One of the solutions to housing unaffordability, she said, was increased infrastructure “joining the dots” between Melbourne, Canberra, Sydney and Brisbane. Even better public transport connecting Sydney, Newcastle, Wollongong and the Blue Mountains would make an impact, she said, giving people more options and in doing so affecting house prices. The online survey, the first research of its kind to be conducted by Core Logic, took in the responses of 2,010 Australians aged between 18 and 64 years old. DOWNSIZING & MORE ABOUT THE PROHIBITIVE COSTS OF DOWNSIZING BESIDES STAMP DUTY! CAAN … on further thoughts about “How to Encourage Seniors to Downsize” … we recommend you think about these! ADVOCATES OF SQUEEZING OUT OWNERS OF DETACHED DWELLINGS in desirable areas are incapable of understanding. The keenness that a cabal of interest groups have in promoting downsizing, and a broad based LAND TAX is alarming. Why has this emerged? -given the cost of metropolitan living it is unlikely not much money will be left in the coffers of those downsizing; there’s not going to be that lump of cash to be put into SUPER! WE suggest perhaps this Think Tank are peddling a myth, or worse still they are building a belief that they want to be true … and if they bang hard enough some – especially those with the levers in their hands – might then allow it to happen, never mind the consequences! WHAT FORCING SENIORS TO DOWNSIZE REALLY MEANS …. -opening up another avenue for developers to landbank, demolish and redevelop to sell more “new homes” to foreign buyers … because the supply cannot meet the foreign demand! -that the Housing Affordability Crisis locking out a whole Cohort of Aus tralian First Home Buyers is due to LNP Government policies, it would seem have been written by the Developer Lobby! VIEW CAAN Facts Sheet for how the Housing Affordability Crisis was contrived! To make housing more affordable. The trouble is, incentives for downsizing would hit the budget, but make little difference to housing affordability. DOWNSIZING AND WHY AUSTRALIANS DON’T DO IT, AND THE LIMITS TO WHAT THE GOVERNMENT CAN DO! THIS opinion piece reflects the sort of LNP philosophy that leaves a bad taste in one’s mouth! Recommending taxing elderly people to force them out of their homes that they worked 40 or more years to pay for! Targeting them as “Asset Rich” is this in an attempt to create resentment from Millennials locked out of home ownership through sinister LNP Government policies? For example “budget sticks” rather than carrots! Downsizing: Why Australians don’t do it, and the limits to what the Government can do! PHOTO Decisions about downsizing are often driven by emotional, not financial, considerations. Encouraging senior Australians to downsize their homes is one of the more popular ideas to make housing more affordable. The trouble is, incentives for downsizing would hit the budget, but make little difference to housing affordability. Research shows most seniors are emotionally attached to their home and neighbourhood and don’t want to downsize. When people do downsize, financial incentives are generally not the big things on their minds. And so most of the budget’s financial incentives will go to those who were going to downsize anyway. There are three financial hurdles to downsizing. Downsizers risk losing some or all of their age pension, because the family home is exempt from the pension assets test, but any home equity unlocked by downsizing is not. Downsizers also have to stump up the stamp duty on any new home they buy. For a senior purchasing the median-priced home in Sydney, that’s now $32,000. Gerry and Rosemary Franklin made the tough decision to move into retirement accommodation after living in their family home for almost half a century. Finally, earnings from the cash released are taxed, whereas capital gains on the home are not. One proposal would exempt downsizers from the $1.6 million cap on super balances eligible for tax-free earnings in retirement, or from the $100,000 annual cap on post-tax contributions. But this would benefit only the very wealthiest retirees — just 60,000 retirees have super fund balances exceeding $1.6 million. More seniors would benefit from a proposal to exempt them from stamp duty when purchasing a smaller home. And many would benefit from a Property Council proposal to quarantine some portion of the proceeds from the pension assets test for up to a decade. The trouble with all these proposals is that they would hit the budget — because everyone who downsized would get the benefits — but they would not encourage many more seniors to downsize. Research shows that for two-thirds of older Australians, the desire to “age in place” is the most important reason for not selling the family home. Often they stay put because they can’t find suitable housing in the same local area. In established suburbs where many seniors live, there are relatively few smaller dwellings because planning laws restrict subdivision. And even if the new house is next door, there’s an emotional cost to leaving a long-standing home, and to packing and moving. And so, few older Australians downsize their home. According to the Productivity Commission, about 20 per cent of people aged 60 or over have sold their home and purchased a less expensive one since turning 50. Another 15 per cent have “strong intentions” to do so in the future. These emotional factors typically dwarf financial considerations. According to surveys, no more than 15 per cent of downsizers are motivated by financial gain. Stamp duty costs were a barrier for only about 5 per cent of those thinking of downsizing. Only 1 per cent of seniors listed the impact on their pension as their main reason for not downsizing. If governments do want to use financial incentives to encourage downsizing, budget sticks would be cheaper and fairer than budget carrots. Even if they have little effect on downsizing rates, at least they would contribute to much-needed budget repair and economic growth. The Federal Government should include the value of the family home above some threshold — such as $500,000 — in the age pension assets test. This would encourage a few more seniors to downsize. More importantly, it would make pension arrangements fairer, and contribute up to $7 billion a year to the budget. Asset-rich, income-poor retirees could continue to receive a full pension by borrowing against the value of the home until the house is sold. The Federal Government would then recover the cost from the proceeds of the sale. If well designed, this scheme would have almost no effect on retirees — instead it would primarily reduce inheritances. State governments should abolish stamp duties on property, and replace them with a general property tax, as the ACT Government is doing. This would encourage downsizing, although only at the margins. But the real policy justification is that it would help working age households to take a better job that’s only accessible by moving house, and so improve economic growth. It’s a big prize: a national shift from stamp duties to broad-based property taxes could add up to $9 billion a year to the economy. In short, the downsizing debate is a prime example of how governments prefer politically easy options with cosmetic appeal, but little real effect, on housing affordability. If they’re serious about making it easier for young Australians to buy a home, they will have to make tougher policy choices. Brendan Coates is a fellow at the Grattan Institute. John Daley is CEO of the Grattan Institute. CAAN has been notified that the full version that is available online was not printed in the hard copy! There are a few paragraphs missing from the printed version. PHOTO … The last paragraph on-line shared here is a doozy. The state’s top transport officials were warned to delay the recent timetable changes for Sydney’s stretched rail network until early this year after independent experts found “simply too many underlying issues which have not been fixed”, a high-level report reveals. The “sensitive” report, obtained by the Herald using freedom of information laws, also details tensions and resentment between transport agencies, and an unwillingness to relay information to mid-level managers for fear of “politically-difficult leaks”. Sydney’s rail network suffered widespread delays and cancellations to services in Janaury. Despite the warnings, the new timetable was introduced on November 26, and later partly blamed for widespread delays and cancellations on Sydney’s rail network in December and January. Sydney Trains has since cut some train services to make the timetable more reliable. The UK consultants who wrote the report were commissioned by Transport for NSW to assess plans to introduce the new timetable as early as October last year and rate its chance of success. Following their investigation, they urged senior officials to delay it by several months until early this year due to a “substantial risk of failing to deliver the level of performance which the public will expect”. Their report warned there was “little room” for rail systems or obsolete equipment, such as signalling, to fail before the “service might disintegrate substantially”, especially during the afternoon peak. This is, in effect, what occurred. The final report by London’s Railway Consultancy was handed to Transport for NSW in March last year. As well as citing concerns about the practical difficulties of the timetable, the report reveals divides and communication gaps within and between transport agencies. The report reveals ‘resentment and unhappiness” at Sydney Trains towards the lead agency, Transport for NSW. One was an unwillingness by Sydney Trains’ senior management to pass on “sufficient detail” to middle managers. “One of the reasons for this is political concern about bad publicity which might emanate from the identification of ′losers’ (passenger journeys likely to get worse),” the report says. The report also raised concerns that “political worries about particular groups of passengers being disadvantaged” limited the amount of information shared between the lead agency, Transport for NSW, and Sydney Trains. A second concern was the relationship between Transport for NSW and Sydney Trains. Much of the detailed planning for the new timetable occurred within Transport for NSW’s rail service delivery office, which employs more than 100 people, rather than Sydney Trains. This led to tensions between planners at the two agencies. The confidentiality imperative (to avoid politically-difficult leaks) has unfortunately led to insufficient consultation. There was “certainly some resentment and unhappiness” at Sydney Trains, the report said. This could have been due to poaching of staff by Transport for NSW, as well as people who were previously at a higher level “now seemingly on the receiving end of instructions”. But Sydney Trains executive director Tony Eid said the report was outdated and written about an early draft of the timetable, which went through nine further drafts before final implementation. “While we didn’t agree with everything the report said, it helped us identify a number of actions that were closed out before the timetable was implemented,” he said in a statement. Mr Eid said the timetable was pushed back by six weeks from last October, and both Sydney Trains and Transport for NSW agreed a start date in November was the best option. In relation to the timetable, the report’s authors found that “there clearly are concerns about the probability of its success”, cautioning that “matters can turn nasty very quickly in the political environment and may be irrecoverable for many years”. “Unsuccessful timetables are remembered, and this one cannot afford to fail,” they wrote. An internal document reveals that delays to Sydney’s trains are likely to be “cumulative and irrecoverable” during peak hours following incidents. Leaked documents have previously revealed that Sydney Trains warned before the timetable was introduced that delays were likely to be “cumulative and irrecoverable” during peak periods following incidents. Sydney Trains’ key indicator of success is the percentage of trains arriving within five minutes of scheduled times. That emphasis on punctuality, the British experts said, could lead to “services being planned and operated without due consideration of a rail service which passengers are known to find important” such as journey times. They recommended senior managers improve the “KPI system so that railway management address a wider range of outcomes rather than just ‘% on time’”. Patronage on Sydney’s train network has surged over the past year. The timetable will undergo further changes ahead of the closure of the Epping-to-Chatswood line on September 30 for seven months, when it will be converted to carry single-deck metro trains as part of a $20 billion-plus project. Next year, temporary closures of the Bankstown line will also begin to allow for construction of a metro line from Sydenham to Bankstown. In their report, the British consultants did warn that a “more complex stopping pattern” at stations under the new timetable for trains on the Bankstown line, “before then migrating to a higher frequency/slower metro-type service, is rather illogical”. They said local and political opposition to “metroising” the Bankstown line could turn into disapproval of the new timetable, and “needs to be ‘headed off’ by communications in the very near future”. SYDNEY IS GROWING … HOW HAS THIS BEEN CONTRIVED … FACTS SHEET FOR FIRST HOME BUYERS TO FIGHT BACK! YOU can see it happening before your eyes BUT you need the Facts to disarm the Xeno slur, the racist accusations … because this awful predicament has been created by our own Government Policies! -why First Home Buyers are priced out of the property market? -why schools, hospitals, buses, trains are full up? -why all over Sydney we sit in gridlock & not just in peak hour? -why cranes are on the horizon in every direction yet the pollies say we need more supply? WE all need to speak up! Take Action Before We Lose What Is Ours! YOU may want to scroll down to view the headings here to look at what concerns you most! Then click the links to find out more. IF you feel intimidated this document may help you to express your concerns publicly. However, the actual percentage is indeterminate with Proxy purchase! The key points on how First Home Buyers (FHBs) have been locked out because there are no laws to prevent foreign buyers purchasing land in Australia. AUSTRAC advised Four Corners foreign investors/buyers use relatives to set up Shell Corporations! Including Guardian and Investor Stream. The Guardian Visa is a new Visa system which has opened the door to International Primary School Students as young as 6 years old and their guardian to each buy several new properties or one existing property. The Investor Stream Visa on the purchase of property valued at $1.5M to gain a Residency Visa. View the report from Investigative Journalist Michael West: “The Wall of Chinese Capital buying up Australian Properties” … this will not ease up until the Government introduces the second tranche of the Anti-Money Laundering Legislation. ALSO VIEW “BLACK MONEY; MONEY LAUNDERING IN AUSTRALIAN REAL ESTATE” WEBSITE CATEGORY to find more! Scroll down for more from others including Transparency International! Foreign ownership of new built homes was increased from 50% to 100% at the behest of the Lobby Group of Developers in 2008/09. This was allegedly in order for them to gain finance to build. However this racket has been ongoing since 2009 to date. 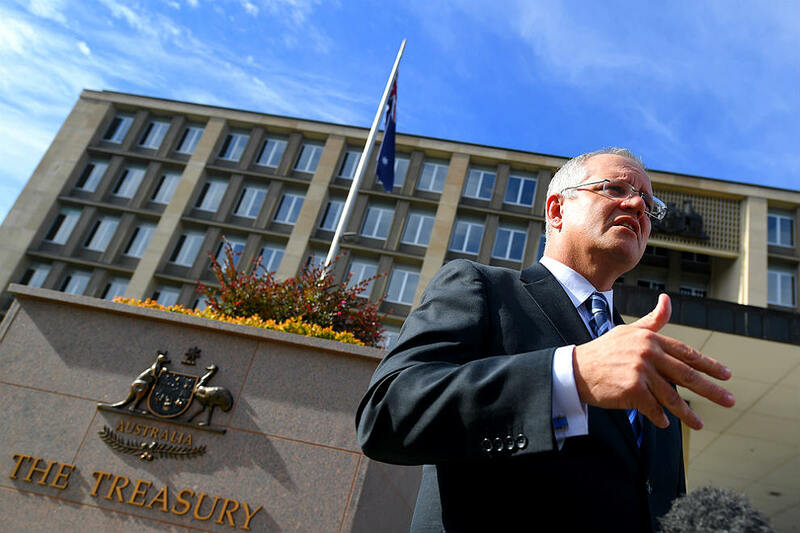 The Treasurer announced in the May 2017 Budget that it would be reduced back to 50%. However what was not widely reported was that 50% reduction only applied to developments of 50 units or more … a sleight of hand. The Plan and in fact what they have pulled off is the rezoning of where we live in Sydney! With the reduction of Lot Sizes as little as 280 – 300 M2 to enable higher density throughout Sydney, and across NSW! All part of “A Plan to Grow Sydney” to be further implemented by the Greater Sydney Commission (the GSC) with Lucy Turnbull (the PM’s wife) at the helm. Could this be the biggest Con of them all? The talk that is put about by the GSC is that they want to activate Boomers to downsize in order to create more “affordable housing” … but that obviously is B.S. because it is not affordable housing for Aussie First Home Buyers it is about inflating the “new housing market” to cater for the foreign buyers 100%. Not only are our suburbs, quality of life, urban bushlands, heritage and communities being destroyed by the high-rise slums but now they plan to create higher density by development of as many as 10 terraces on a SUBURBAN 600M2 lot! 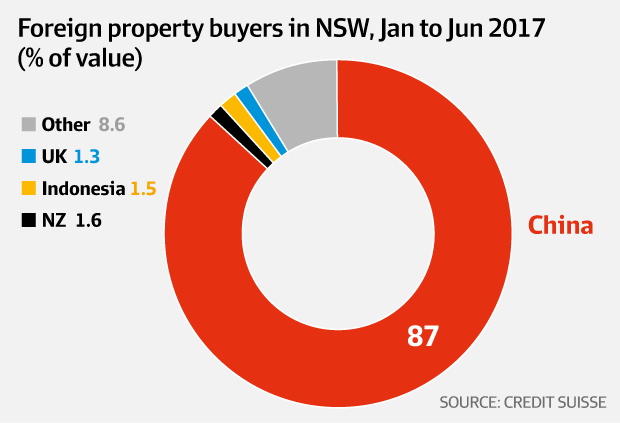 Foreign buyers, almost all of them Chinese, are buying the equivalent of 25 per cent of new housing supply in NSW, undeterred by local taxes or investment limits imposed in China. Credit Suisse’s Hasan Tevfik and Peter Liu have forecast a “stronger-for-longer” scenario for the housing sector after analysing foreign buyer receipts collected in NSW, Victoria and Brisbane. 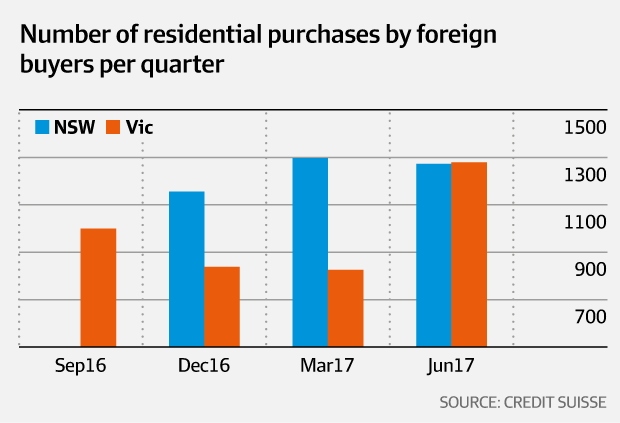 The trend is strong in Victoria as well, with foreign buyers accounting for the equivalent of 17 per cent of new housing. In Queensland, it is 8 per cent. “Almost 90 per cent of foreign demand is from China and there is little evidence that new capital controls by the Chinese authorities, announced in December 2016, have slowed demand for Aussie housing,” the analysts wrote in a report released overnight. 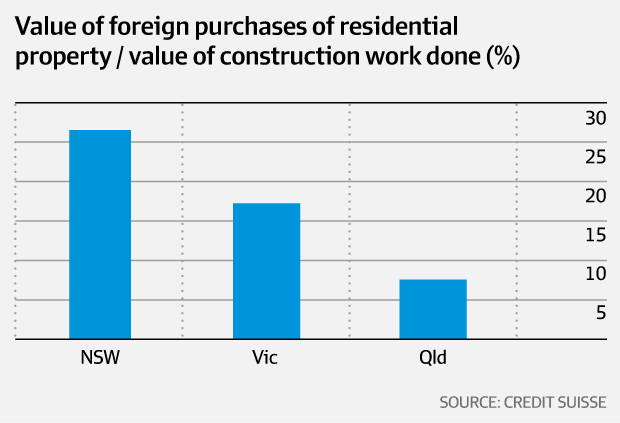 “We think the tailwind of Chinese wealth creation will mean more, not less, foreign buying of Aussie housing. In Sydney, house prices fell by 0.1 per cent over September, the first fall since late 2015. New dwelling approvals have also been sluggish. In their report ‘Build it and they will come’, the Credit Suisse strategists expect the moderation in housing activity and house price inflation to continue. “But Chinese demand suggests we ought to remain skeptical of a collapse,” they wrote. Following an initial report in March this year, and using Freedom of Information requests the Credit Suisse report collates tax receipts collected by the state revenue offices in the three states over the 2016-17 financial year. It found foreign buyers are pouring an annualised $5.9 billion into residential property in NSW, $3.4 billion in Victoria and $700 million in Queensland. That investment is just a tiny fraction of the national housing market, worth $6.7 trillion, or $5.6 trillion in the three east coast states. However, the report notes, it represents a large proportion of the value of new housing supply. While the Chinese dominate overall foreign demand, it is Americans who spend the most on each property, with an average purchase price in Sydney of $1.7 million, according to Credit Suisse. Indians spend the least, averaging less than $400,000. From July 1 this year, NSW doubled the stamp duty on foreign buyers to 8 per cent and increased the land tax surcharge from 0.75 per cent to 2 per cent. Along with stamp duty and a federal fee, a foreign buyer is saddled with a 12 per cent tax burden before they can take possession of their property.”Will the most recent increase in tax be enough for her to reconsider and cause house prices in Sydney to decline? International experience so far suggests not,” the Credit Suisse analysts wrote. Victoria and Queensland also impose taxes on foreign buyers of residential property of 7 per cent and 3 per cent, respectively. The prospect of higher surcharges on foreign buyers, along with the further depreciation of the renminbi – thereby making Australian housing less cheap compared to the cost of Chinese apartments – represent risks to Chinese demand for real estate here. Offsetting these risks, in the Credit Suisse view, is the “tailwind of Chinese wealth creation”. 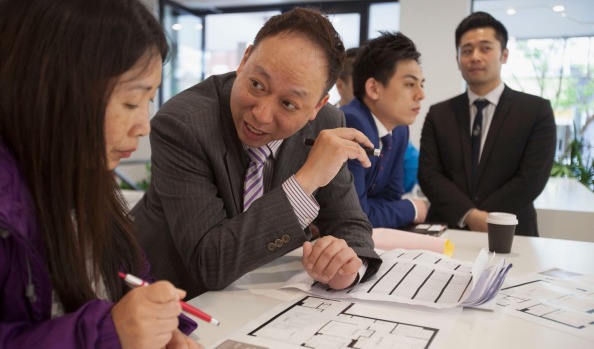 Chinese millionaires account for much of the real estate buying in Australia. Six years ago, their wealth would have covered 1.2 times the Australian housing market. Now it covers two times the value of local housing. 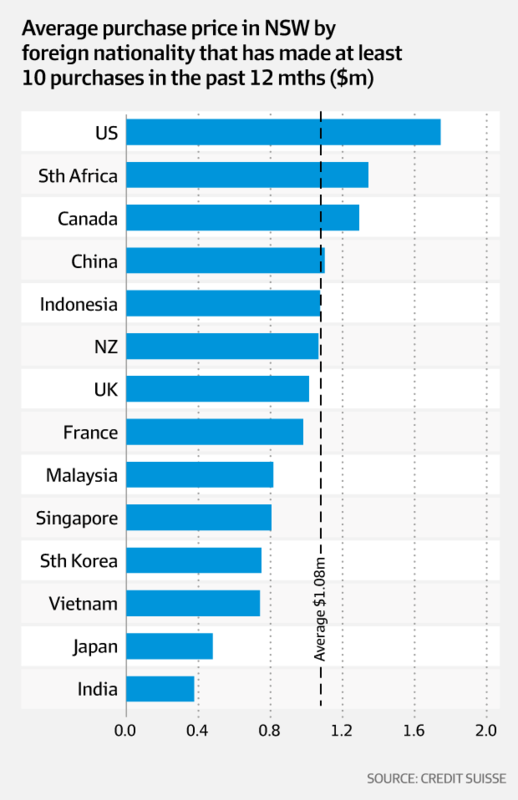 “As our property market becomes more global perhaps we should be concentrating less on Australian incomes as a measure of buying power and more on wealth creation in the Asian region,” the analysts wrote. All this is good news for major developers such as Lendlease, Stockland and Mirvac, the report noted. The big four banks also have exposure to the residential market, along with building materials companies such as Boral,BlueScope Steel, Dulux, CSR and Adelaide Brighton. Credit Suisse have added Fletcher Building to their Long portfolio and also cite property websites REA Group and Fairfax Media, the publisher of The Australian Financial Review. “The foreign buyer has never before been as an important driver of the Australian housing market as she is now,” the analysts wrote.